Take the frustration out of meal time by teaching your kids to love real food right from the start! These tips created two great eaters in my family, even through the toddler years, and I am so excited to share how to raise a healthy eater in 10 easy steps! Pretty bold title, right? I’ve gotten a lot of requests to post my favorite tips for raising healthy eaters, but I’ve put it off over and over again. Why? First of all, I’m no pro. I am a mom. Further more, I’m scared of Murphy (you know, Murphy’s Law). I have the lingering fear that as soon as I type up all my “rules” for raising a healthy eater that she’ll decide she wants nothing more than crackers for every meal. Now that I’ve posted my disclaimer, here we go. These are things that have worked for us and are tips that I hope help you with your kids! 1. Start in the Womb. While pregnant with Hailey, I remember reading that babies in utero start swallowing amniotic fluid around 12 weeks and that their taste buds develop around 21 weeks. There are multiple studies that suggest babies quickly learn and prefer the flavors they are exposed to via amniotic fluid. I remember taking this “eating for two” and keeping in mind I was “tasting for two” too. I made sure to load up with healthy foods, like and array of vegetables, beans and whole grains, as well as strong flavors I loved, like garlic and spicy foods like Indian cuisine. Additionally I limited my sweets to a handful of dark chocolate here and there in hopes that she wouldn’t develop a strong preference for sweets. This wasn’t too difficult since I don’t have much of a sweet tooth, but poor Hailey will more than likely inherit my chips and salsa tooth. To this day, Hailey enjoys strong flavors, like salsa in her eggs and not-too-spicy Indian food. Coincidence? Maybe. Fruits are healthy foods and no doubt healthy for us, but they are much sweeter than vegetables. Hailey’s first foods were avocado and sweet potatoes, and sweet potatoes were as sweet as we went for a while. I wanted her to learn to enjoy vegetables before deciding she preferred sweets, so she ate potatoes, avocado, peas, green beans, broccoli and beans all before I gave her many fruits to try. Of course she went on to love bananas, blueberries, pears and apples, but once we added those, she still did great eating her greens. 3. Try Different Preparation Techniques. Just because Hailey wasn’t wild about a food on her first try didn’t mean I retired it to the dislike list. In the same way that I won’t eat a boiled Brussels sprout, but I’ll devour roasted ones, I try different preparation for foods. Try roasting instead of boiling, or pan frying instead of steaming. Maybe even solid state instead of puree, or vice versa. Before you give up on raising a healthy eater, try these alternatives for preparing veggies! When Hailey was really young, she would eat plain black beans like crazy, then one day she stopped. I tried one to make sure they hadn’t gone bad and decided it was pretty bland. I threw a handful in a pan and added a little olive oil, lime juice, a sprinkle of garlic powder and salt. I gave them back to Hailey and she gobbled them up. I believe at a certain point babies and toddlers want a little flavor in their food too. 5. Don’t Make Them Finish. When you think of feeding toddlers do you always think of the parent begging “just one more bite?! ?” I know I always think of that and have found myself doing it once or twice. It is important to me to not make meal time stressful and I wanted Hailey to learn to listen to her internal cues. If she wasn’t hungry, I didn’t force her to eat. I offered her food two or three times and if she insisted that she was all done, then I let her go play. She would usually eat more at the next meal and it all evened itself out. Take the frustration out of meal time with these tips for raising a healthy eater! 6. Don’t Use Reward Foods. It’s true some nights she would eat all of her tomatoes and only a few of her green beans, and that was ok with me. Toddlers seem to be on a power trip sometimes, don’t they? I thought that was a teenage thing, but no, it starts at age 1! Hailey liked to assert her opinion and I liked to give her some control over her food choices. I’d show her peas and broccoli and let her choose between the two. I’d put out yogurt and a cheese stick, then she’d pick which one she’d prefer. I hoped to let her feel in control with decision making and was happy to do so, as long as the choices she had to choose from are all winners. When kids are little, they mimic our actions, our words and our eating habits. If I was standing at the counter eating peppers and hummus, she wanted some, too. If I was chowing down on pizza, she wanted that, too. I ate both and Hailey ate both, too. I wanted her to eat what I was eating, so I tried to make my choices wholesome and varied. I know we’ll eventually hit an age when she wants to do everything opposite of what I do, so I’ll take advantage of the mimicking while I have it. 9. Don’t Stick to Traditional Foods. Young children don’t know what traditional breakfast foods are, so don’t feel obligated to stick with them. It’s true we usually have eggs, yogurt, oatmeal or fruit for breakfast around here, but there have been times when I gave Hailey frozen peas, leftover pasta and tomato sauce (we were low on groceries). She happily downed it. When Hailey had a cold, I put warm chicken broth in her sippy cup. After a strange look, she sucked it down. Kids don’t know what normal is because you’re creating their normal, so let them think that smoothies are supposed to be green and stuff as much spinach in them as you like! Is your child slow in warming up to solid foods? Does she throw food at you (I know Hailey didthis)? Absolutely despise broccoli? Don’t let it stress you out. Meal times should be fun times that create a positive correlation with healthy foods. Furthermore, as with everything, each child’s experience is unique. If they only want to eat a bite or two at one meal, go with it. Won’t eat cauliflower no matter what you do? Pick a different veggie. If you have any real concerns about weight gain, talk to your doctor, but otherwise, just roll with it. They’ll be fine and they’ll eat when they’re hungry. Ok, I’m done. If Murphy’s Law comes to bite me, my next post will be all about how to sneak vegetables in to innocuous foods. What tips do you have for raising healthy eaters? Great post! Hailey is adorable. Quick question, could you tell me what car seat you are using for Hailey? Thanks a lot! I’d say my biggest tips are to not stress about getting it all into one meal, and hide what you don’t want them to see. My 19 m/o is a carb FIEND. If he could eat crackers, bread, and rice all day every day, he would. It needs to be out of sight. But if he eats only rice one meal (which, he may insist on), I just make sure the next is peas and blueberries, or cheese, or whatever other strange combination strikes his fancy. Some days? He’s agreeable (this week he happily chowed down on an Indian-spiced chickpea stew). Others? He’s showing his age. 😉 I agree completely with your tips, and most of all, the Don’t Stress! Great article. Hope you include it in your book. I like how you are giving H choices too- talk about a way to make her feel empowered. I need to give L more options, thank you for the great idea! I have actually have had trouble with L eating her veggies in the last few months when she sees what else she gets to eat (that she has already determined is “better”), so we’ve started giving her veggies first, kind of like an appetizer, and once she’s done with them, we bring in the rest of her meal that we hid in the other room. That has really helped us ensure she eats all of her vegetables. Love the idea of veggies as appetizers! It makes it sound fancy, too, which I think H would like once she is older. Creative way to make healthy eating work- thanks for sharing! Great post! I’m not even a mom yet, but I found this SO interesting and helpful! I totally agree about not making it a battle! I know we’ll hit our picky phase sooner or later and I plan to approach it the same way you are and continue to offer healthy foods and making do with what works. No need to stress! It is extremely common for little ones to eat almost anything up until a certain point and then get more selective. With my daughter it happened at 2 1/2. Now at 4 she hasn’t gotten back to how she was as a baby/young toddler, but she’s much better. It takes persistence and consistency for sure. And sometimes, you have to break the “rules” a little to get them on track. 😉 For a while she just wouldn’t even TRY the vegetables I offered her. When I set up a little reward system, she started trying them. I knew I’d done the right thing when one day she said, “Hey, vegetables are GOOD!” as she gobbled up her raw red bell peppers. My son is 12 months and will eat anything I offer him. I’m enjoying it, but know that it may not last forever. This is great- all things I want to try to do with our little girl once I start her on food. Great tips! This is such a great and helpful post! I’m going to begin the solid foods process in a couple of months, and this is wonderful reading for getting the wheels turning! The biggest thing I am learning is let them try everything. I was so worried about giving my daughter tofu, but once I gave her some she went crazy. Also, be your own guide. Don’t worry too much about other moms, or other babies or even books. Only you can know what is right for your baby… within reason, I suppose. I think you hit the nail on the head- do what works for you. I’m a huge advocate of mom (and dad) knowing what is best for their child. Great reminder! Oh yes, letting them see and help with prep- LOVE IT- thanks for bringing that up. I look forward to farmers market trips with H and letting her pick out the produce and then helping cook. So much fun is just around the corner! These are great tips and I think you are following a wonderful philosophy! I never knew about the amniotic fluid and taste bud development, so that is really cool info. The beginning with veggies idea is new to me too, though it does make some sense! And it’s kinda cool to see a baby’s taste prefs become more complex over time, like they did with the plain black beans no longer satisfying Haley. It’s funny how everything used to be so “FINISH YOUR PLATE” and now it seems that it’s the opposite in society – “DON’T FINISH YOUR PLATE”. Not with children but with everyone! Trust me, I was raised on “reward foods” and it kinda messed me up in the long-term and even today in terms of viewing certain and even all food on a pedestal, as something that has to be “deserved”. So I think that not using reward foods is the most important tip on this list. I wonder if some of this has to do with the babies temperament? My son is very spirited and we have had our issues with sleep and food. Luckily, his sleep is better but solids are a source of stress for me. Like you, I always offer healthy choices but he won’t touch meat, pasta or cheese. He loves bananas, most fruits, whole grain bread and yogurt but I do worry about it! He is 11 months and still drinks a good bit of formula so maybe when he goes to milk his solid intake will increase? I’m trying not to stress but it does bother me sometimes.. I won’t pretend to know the answer, but I have heard that decreasing the amount of milk or formula usually results in increased intake of solids. I’m NOT suggesting you do that; it’s just what I’ve heard from friends and such. H isn’t big on meat either. I try to just monitor to make sure she’s getting in a bite or two or protein from another source. It sounds like you are on top of it and doing a great job, so certainly don’t stress. I don’t have children (and don’t plan on it for awhile), but I want to save this nugget of wisdom for when I do! Great tips. Love that you included leading by example! It’s true that our little sponges just soak up all we show them so we better show them something good! Sarah recently posted..Merry Christmas Cookies! My problem with our son (17 months) is that he won’t even try things. I don’t care if he doesn’t like something but it is frustrating when he won’t even put it in his mouth to try! I probably sound like a “mean mom” but I’ve started to put him to bed without supper if he won’t eat what I make him. I was getting into a bad habit of making him the same thing every night just so he’d eat something. I want him to eat what everybody else is eating. What else is super frustrating is that he will eat (everything) at daycare – I have made the exact same things and he will not eat them at home. Sorry – I didn’t mean for this to turn into a rant! Your tips are awesome and I am going to experiment more with flavors and roasting/boiling. I think it’s so funny that he’ll eat everything at daycare and not at home! I shouldn’t say “funny” because I’m sure it’s beyond frustrating, but what a crazy observance. I don’t think you are a mean mom if you offer him dinner and he doesn’t eat it. I’ve done that with H a few times when she’s only eaten a few bites. She continually told me all done, so I said ok and put her to bed. She was just fine and was ready to eat breakfast in the morning. Sometimes I truly think they just aren’t hungry. I hope he makes things easier on you soon, but in the meantime, don’t worry. It sounds like you are on top of it and are a GREAT mom because you care so much. Hey Erika! I teach preschool and hear this from parents every year. At school the influence of classmates eating the same food is positive peer pressure. A child may not be interested in something but pointing out how much another child likes it always helps. They are much more likely to try something they see other kids eating than if they are verbally invited to taste a new food from an adult. Hope this gives you some preschool/daycare insight! Great post and i 100% agree!! Parker is a good and healthy eater for most if not all of the reasons you mentioned. …and because his digestive tract was even more developed. I agree with all of these BUT part of it is luck of the draw and age. I did most of these things and cook healthy, whole foods 90 percent of the time. However, my daughter is almost 3 and once they discover they DO have choices and that foods like french fries and cupcakes exist, it gets much much harder. When she was younger, I had complete control over what she ate and she would just eat what I put on her plate. Now every meal is a negotiation and I try not to make too big a deal out of it because it seems to only make it worse. So hopefully your little girl continues to be such a good eater but other mom’s shouldn’t feel bad if their kids are a bit more challenging because you can do everything on this list and still have a very picky eater. What a great post! I am not sure if you remember but I met you awhile back at Nate & Sus’s one Sunday afternoon when they had a few people over 🙂 My son, Brayden, is a little over 9 months now and I have been trying to move on from purees and introduce more solids. I keep coming back to munchkinmeals for ideas but have not had too much luck yet. I may not be being patient enought to really let him explore the food since I’m so use to him just “sucking” down purees! I really want to try your egg recipes but was wondering if you started Hailey with only the yolks? I’ve read that the whites should be introduced later but I haven’t read into much detail around why. Any tips/suggetions would be appreciated! Thank you and I hope you enjoy your weekend! When H first started solid food via BLW she didn’t eat a ton. I think it takes time for them to play with it, explore it, then manage to get some down, like you said. I started H on with yolks only, but quickly switched to whole eggs. We don’t have any allergies in the family and I guess I was feeling bold. I’m not sure when it was- maybe around 8 months? Like everything though, only do what you are comfortable with! Hope to see you guys around again soon! I’m a developmental psychologist and have read about the research on exposure to tastes in the womb. It is TRUE. I have also seen this with my son. When I was pregnant I didn’t have particular cravings, but I craved variety. I see he wants variety too. Sure, he could eat favorite foods 4+ times each week, but he doesn’t want an identical lunch every day. One thing you didn’t mention that I’ve found helpful is to consider the texture. You mentioned the chicken soup in the cup (I’m gonna try that one). Again, my son has had a really hard time teething. When we know it’s a bad week for his teeth, we try to offer foods that are easier to eat (e.g., mashed potatoes) and favorites that he will want to eat even if it is a little hurty. Just thought I’d mention it in case it helps someone else with a painful teether. Jessica recently posted..This blog has the right name! 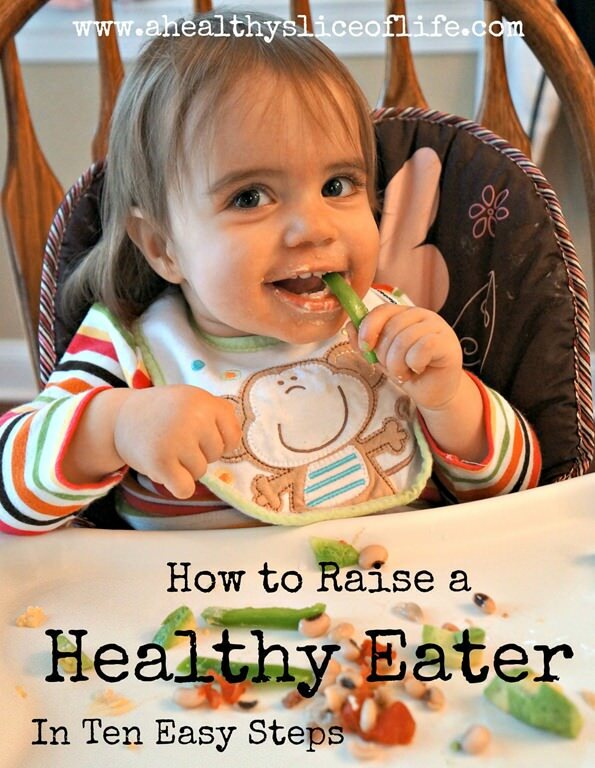 This may be the best list of tips for raising a healthy eater that I’ve seen. Great job! My kids are grown, they all eat a variety of foods and the ones that are on their own still eat lots of produce and not many sweets. One other tip that I would add is to not give up on a food that your child doesn’t eat– not just after one time, but after many times or even years. When my kids were little, if we were serving a food they hadn’t liked to eat, I would still put a little on their plate. But no comments about whether they ate it or not. When they were a little older and serving themselves, I would ask them to take a ‘no-thank-you helping’ of foods they didn’t prefer, to put just a little bit of it on their plate. Once in a while I would encourage them to try a tiny bite of the disliked food, but gently and if they didn’t want to that was fine. I figured it was my job to serve healthy food and theirs to decide what to eat. Now that they are much older, on their own they themselves will sometimes take a bite of a food they haven’t liked in the past to see if their tastes could have changed. There are only a few things that one or more of them seriously dislike: mushrooms, eggplant, broccoli and other crucifers. This is such an amazing post!! I’m sharing it with friends who have little ones 🙂 love it! Danica @ It’s Progression recently posted..workouts 1/6 – 1/12: the best week in months! This is such a great post! We have done this with our little guy and knock on wood, he continues to be a good eater at 2! I also think involving them in the grocery shopping, preparation/cooking, as well as having them eat what you eat (when age appropriate) is a key in raising a healthy eater, too! Quite interesting elements that you have mentioned, a big heads up for publishing. Informative article. Eat roughly the same amount of calories that your body is using. A healthy weight is a balance between energy consumed and energy that is ‘burnt off’. John recently posted..What is MBA? get that tpe of info inn such ann ideal manner of writing? at tthe look for such information. Hey just wanted to give you a quick heads up. The text iin your content seem to be running off the screen in Ie. Recently Apple has acquired lots of popularity everywhere. better. (Note: a post will be written by me later about why Macs are much better than PCs simply to be rational). although it is going to still hold many surprises for you! advice on how to get through university life, courses and all the other obstacles that you will encounter in your efforts to achieve college. area connected through international tools, life is so quick and information flow is really high. capabilities, from universal text-messaging, email, to visual voice mail, web-browsing, Wi-Fi connection, etc. video-calling (face-time), eBook readers, magazines, movies, games and applications. If get a Iphone-4 in your fingers enjoyment is constantly with you. It is really a stunner and how to transfer photos from iphone to pc. You’ve got this down. Ol’ Murphy can’t touch you! Well said and practiced. John J. recently posted..Feelings: “26 Feelings You Should Experience At Some Point In Your Life!